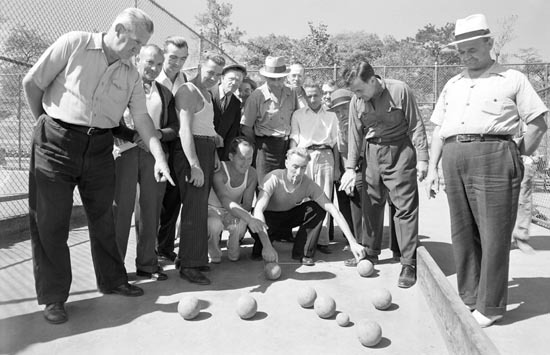 Bocce is a game that has ancient roots and modern significance. It has been a part of the Italian immigrant tradition in America for well over a hundred years; there are as many variants of the game as there are small villages in Italy. We have seen a resurgence over the last twenty-five years or so. New York City has an array of public courts, and San Francisco is mounting a comeback, both at the city and grassroots levels. The private sector is also getting into the act, with some locales now combining the game with eating and drinking, which are also part of the great immigrant experience. 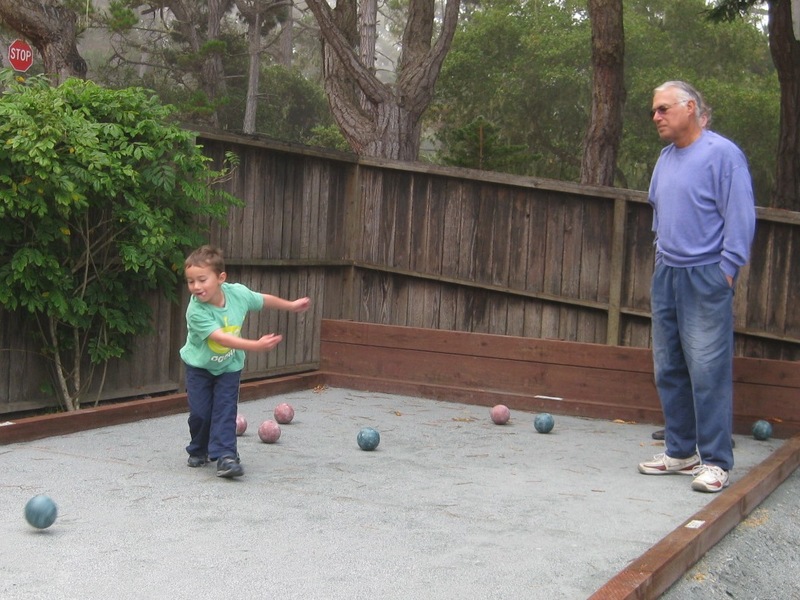 The charm of bocce is that it can be played anywhere, even on a grassy, unmarked field. However, a variety of surfaces and court sizes have become more or less standard. 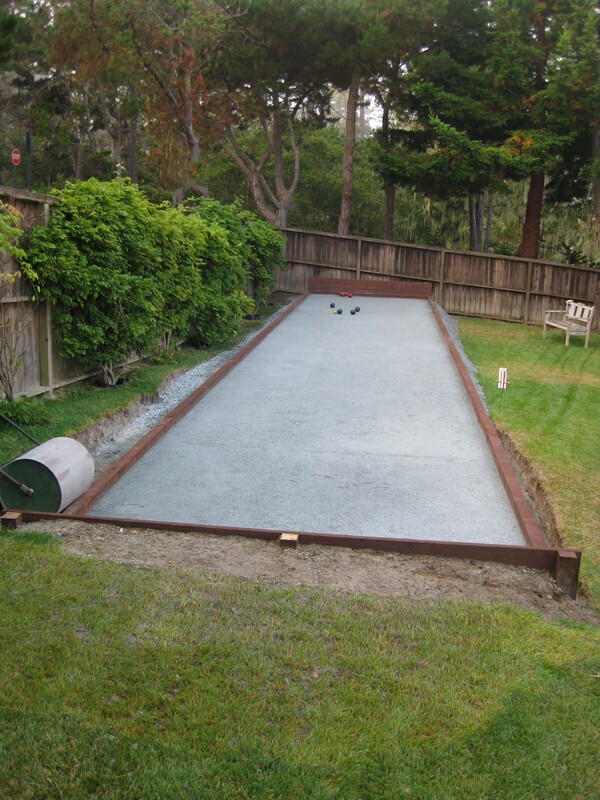 With this in mind, we set out to build a bocce court in our backyard in Pebble Beach. 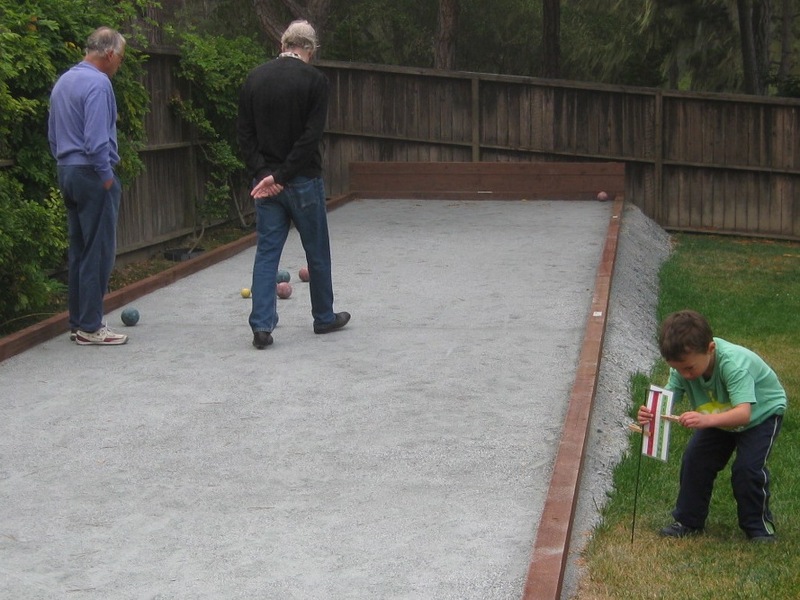 With apologies to Jack Tilford, bocce is what you do when you can no longer play golf. (He maintains that golf is what you do when you can no longer play tennis.) I guess I am getting ready for my dotage with the grandkids. If you are interested in learning more about the game and its rules, a very useful source can be found here. Our immediate ancestors in action? The only piece of land available to us was the area behind the bedrooms of our house. It was just big enough to put in a standard court (60' by 10', one of the many standards!) without performing unnatural acts. However, the previous owner of the property had had a different idea. He took a more or less level piece of land and created lots of mounding. Then he planted grass that could be closely mown, so that he could have a practice putting green. Although the project got most of the way done, he decided to sell the house before actually completing it. So we had grassy knolls to work with, and therein lies the tale. 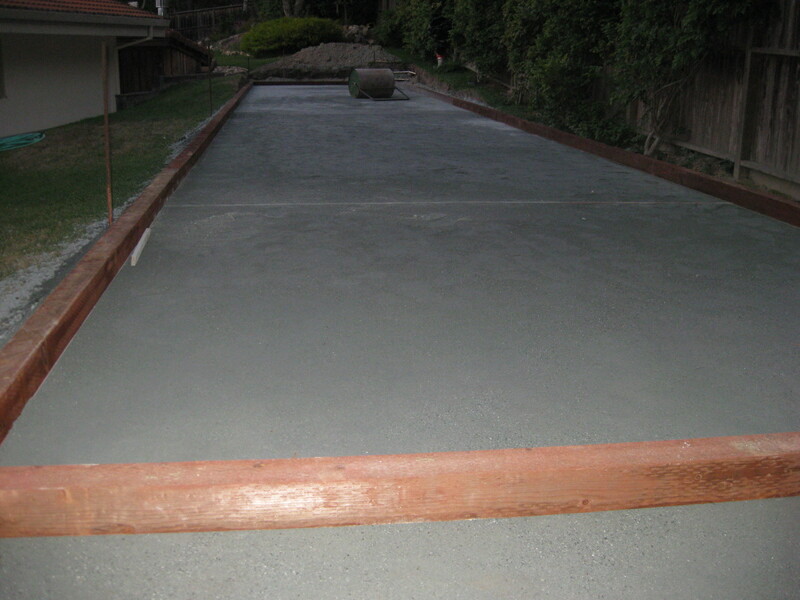 Ideally, a bocce court is a surfaced rectangle that is flat and level in all directions. 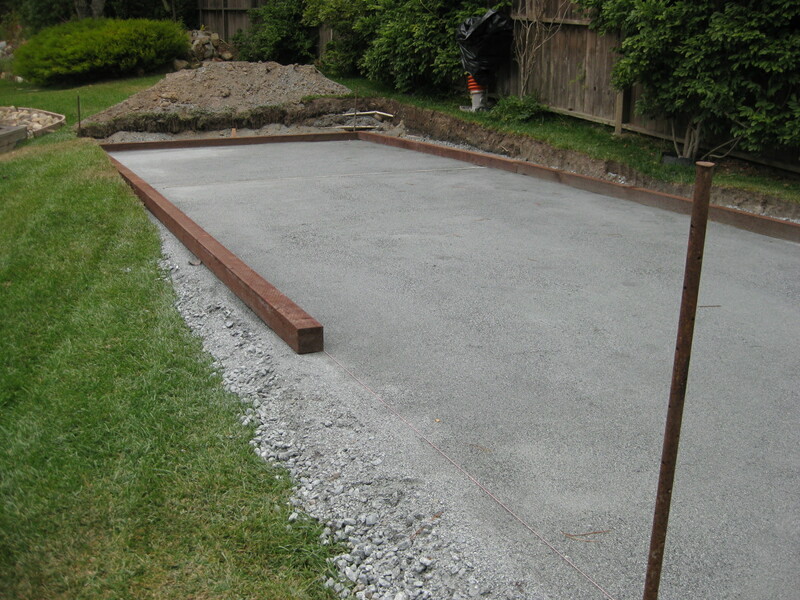 That would be the Platonic Ideal Bocce Court (PIBC). Of course, no such court exists in the real world. However, the closer one can come, the better. Problem statement: Lots of dirt to move. 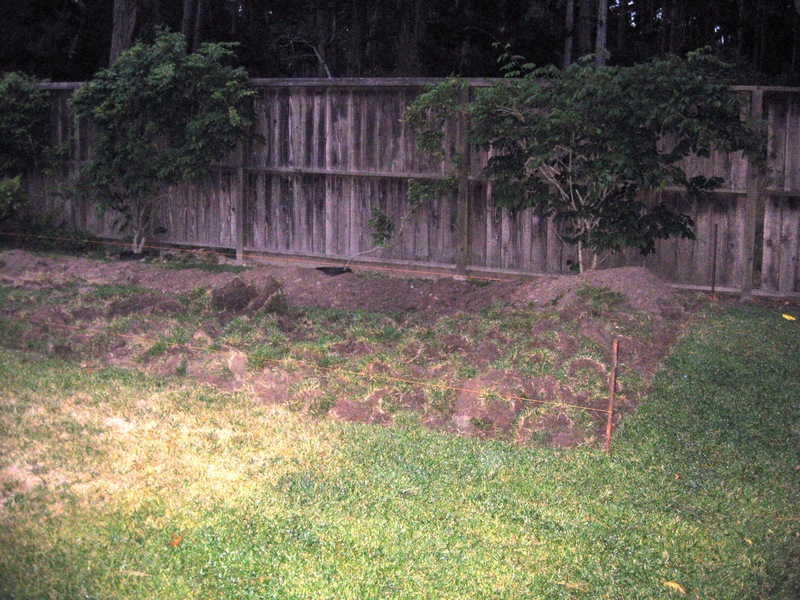 The area in question had a significant slope as well as bumps and mounds. 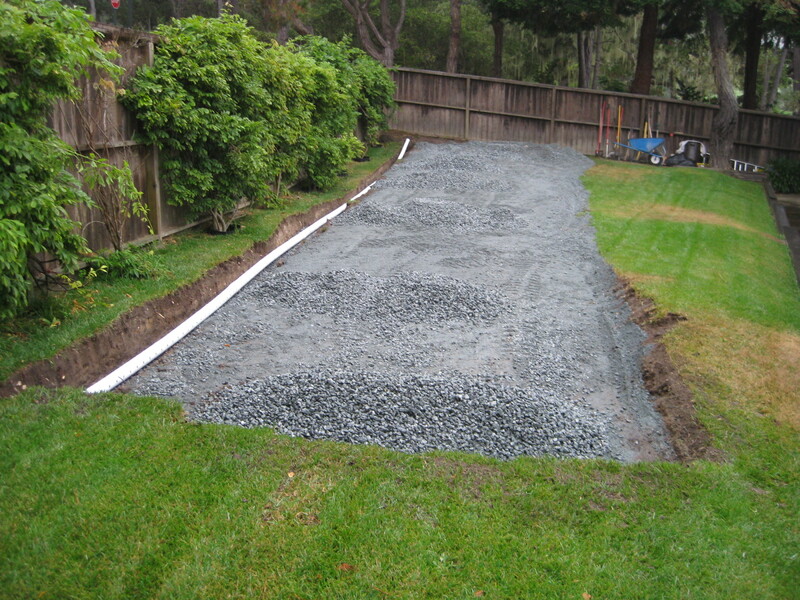 To achieve planarity, some areas would have to be dug out and other areas raised. This was definitely not a do-it-yourself project for a geezer. A quick survey of various contractors revealed several who could get the job done. 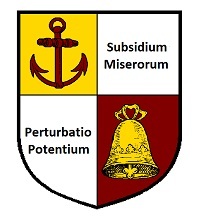 However, their prices required that we live many more decades to amortize the investment. Bad news. The good news was that we knew a very honest, competent guy who is not afraid of work. The team we put together was very simple. 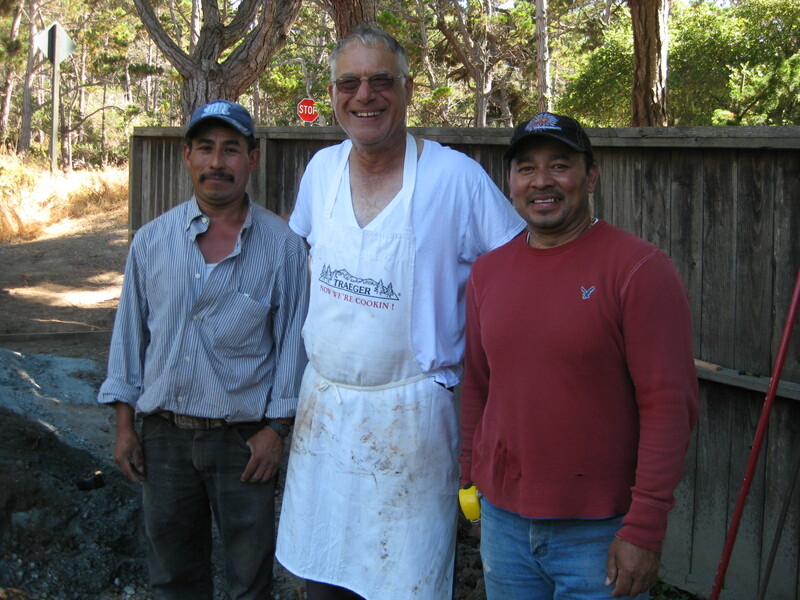 Hector (on the right) was the contractor who organized the job and did half the work. His colleague, Camillo (on the left), did the other half. I consulted on the design and did various measurements along the way to make sure we built something resembling what we thought we wanted. Hector took care of all the drainage issues, as he was the man who had previously put in the mounds. He also saw to the delivery of all the materials, and to the rental of power equipment on an as-needed basis. The entire project from start to finish took seven working days. Work was begun on Monday, September 6, 2010 (every day is Labor Day if you are Mexican-American) and was completed on Tuesday evening, September 14, 2010. The first day of every project is a mixed bag. There is the natural enthusiasm of getting started, offset by inertial difficulties and the minimal progress made. At the end of the first day, the only visible change was that a lot of grass had been turned over, and some stakes had been planted. The picture was taken either at dusk or dawn of the next day, which explains why we had to use the brightness corrector. The original was an accurate visual of how we felt. If the police were present, they'd advise, "Move along, nothing to see here." Things began to pick up on Tuesday. 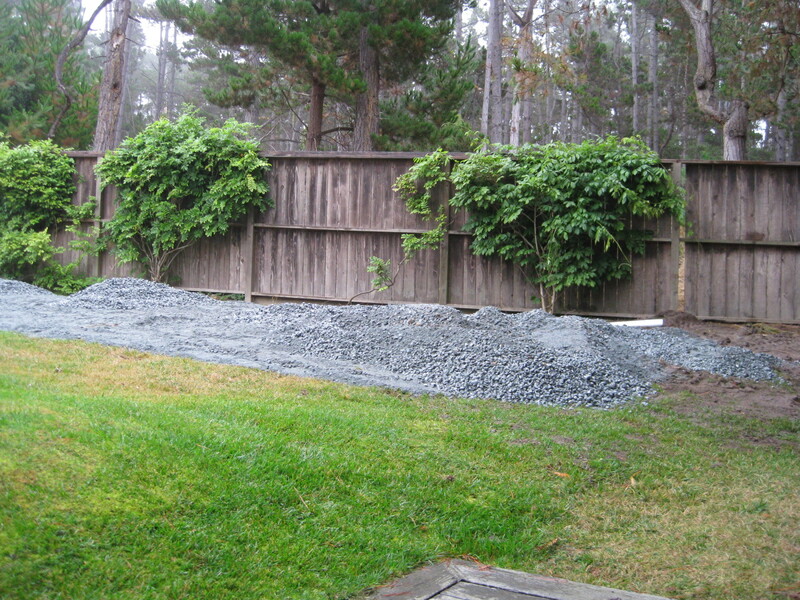 The first load of rock and gravel was delivered, and Hector started to spread it around with the Bobcat. We also made the acquaintance of some strange machinery that pounds things over and over again. More on this as we move through the project. At times it seemed that Hector was building the pyramids with the help of only one guy. But never was heard a discouraging word. It doesn't look like much at this point. Rome wasn't built in a day. Or two. It's definitely starting to take shape. Notice the French drain on the fence side with its pipe. At this point Hector and Camillo began a daily ritual of compacting the base rock, checking for level, and redistributing material. This was done every morning and every evening as things settled. Note how much dirt has been dug out in the foreground; later you will see a corresponding build-up at the other end. Because of the deep cutout, we realized we would need a retaining wall at the "pool end" where the court was below ground level. Thursday was kind of "hump day" for the project. It still didn't look like much that morning, and the perpetual redistribution of rock and gravel was beginning to get tiresome. At this point Hector started working with the finer sandy material that would be the top surface. In the top picture you can begin to understand the level problem. We had to raise that end of the court using rock and gravel, not dirt, so that we had a solid base throughout the entire length. In the bottom picture you can begin to see how much we had to dig into the hill. In order to get the "flat runway", there was substantial excavation at one end and substantial build-up at the other. By the end of the day, we could make out the court if we squinted a little bit. The platform was in place, but it became clear that the project was going to run into the second week. Not to mention that everything got re-tamped at least twice a day. Hector's approach was to constantly keep heights and level under control, reducing variances as he went. It proved to be a very good strategy. On Friday Hector began laying out the top frame. Note that the foul lines and center line have already been embedded in the surface; you can't see them in this view, but they are there. In fact, measurement showed that one of them was "off" by a few inches and had to be repositioned. Hector became much more careful with his tape measure after that exercise. It was clear that the full framing operation would have to wait until Monday. That needed to be done with the whole team so that, once the frame was in place, the anchoring rods could be driven home. Monday saw the full frame put in place. This picture was taken very late in the day. You can see the entire frame in position, and the roller used for the compaction of the fine grain material is at the far end. The frame has been screwed together and measured, and now just needs to have the anchoring rods driven through the wood and rock and gravel platform into mother earth. Still to be done are the retaining wall at the far end, and a corresponding back wall at the near end for symmetry. 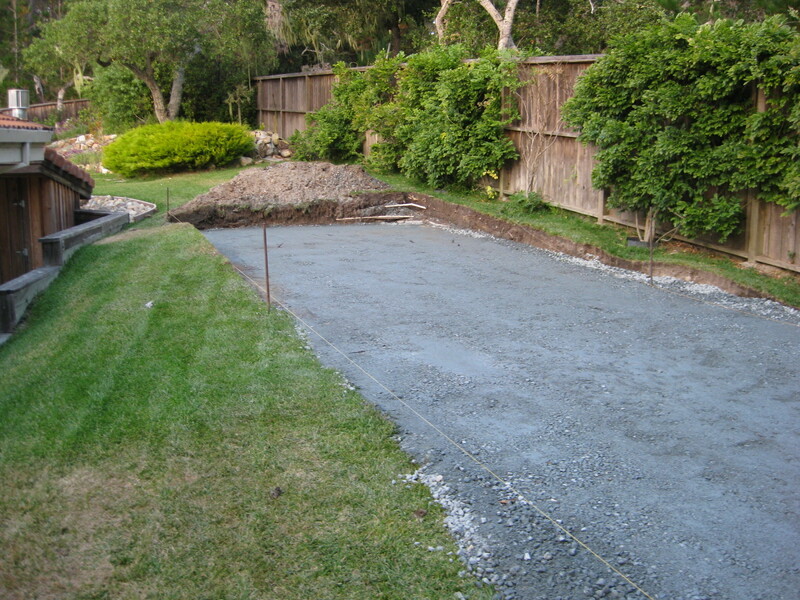 That was accomplished on Tuesday, the last day of the construction work. 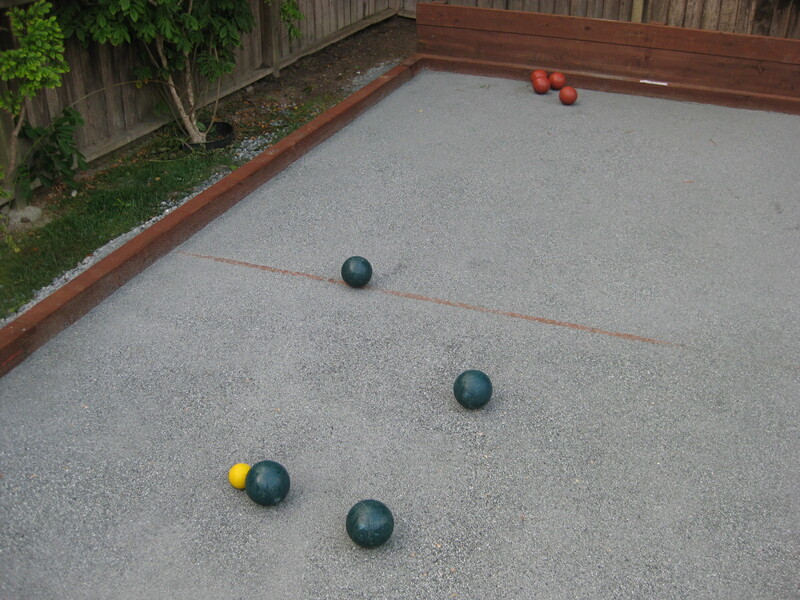 Today saw the arrival of our used vintage bocce set, purchased on eBay from a lady in Newark, New Jersey. Timing is everything. The finished product. You can see the back wall at the far end, where we had to elevate. The back wall at the near end also serves as a retaining wall. The first game has just been played, and you can see the balls at the other end of the court. The bottom picture is a close-up. Green ran his first ball right up against the yellow pallino; Red then missed knocking it away with his four balls. Green then profited by nestling his remaining three balls comme il faut. The project ran over by about two days, and came in at 16% over cost. 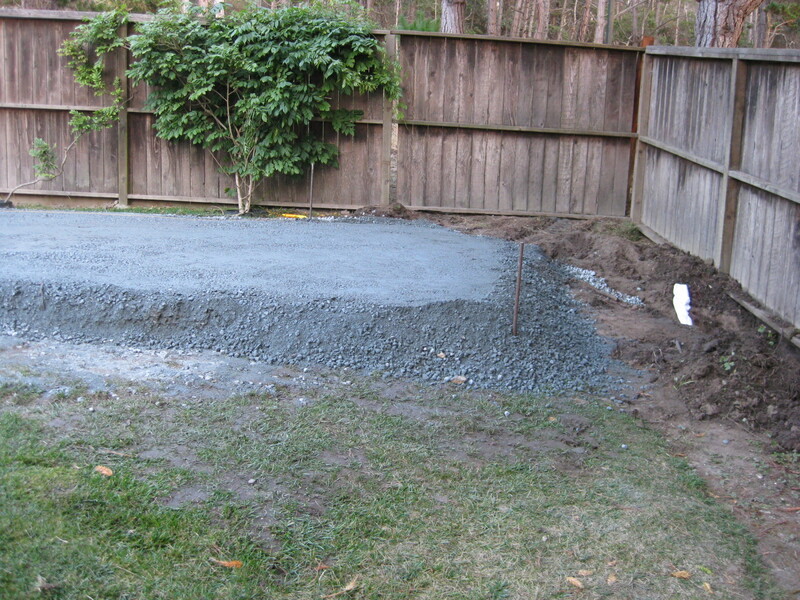 Our estimate was much too tight on materials: We underestimated the amount of rock and gravel fill we would need, as well as neglected additional materials for the back walls. 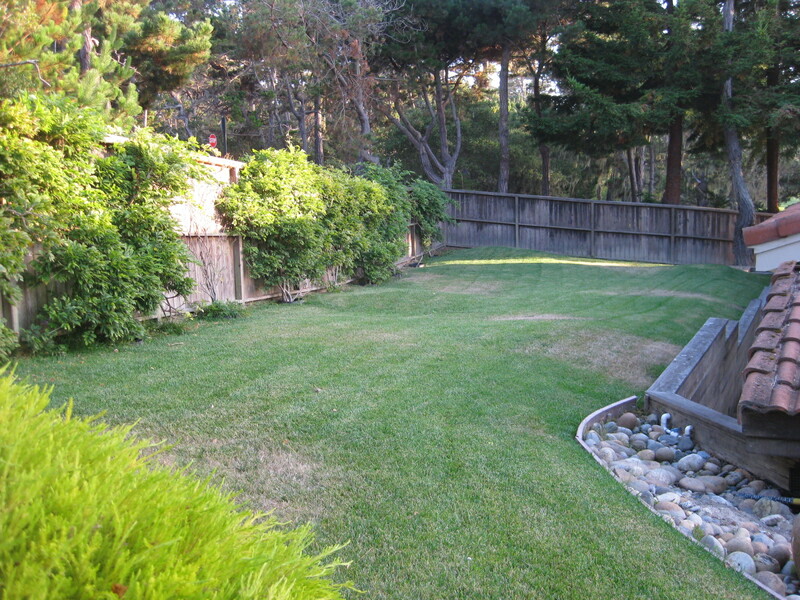 However, we got an unexpected rebate from the Monterey Peninsula Water Management District for reducing the amount of water our landscaping requires. This offset the overrun, so that the project actually came in a little under budget. We are very happy with the outcome. The surface is fine. There is an interesting optical illusion in play. Because everything else on the property slopes, including the fences, it appears that the court is not level. However, I have measured it along every axis with a precision level, and found no deviation from horizontal of more than one half of one per cent. That Hector knows what he is doing. 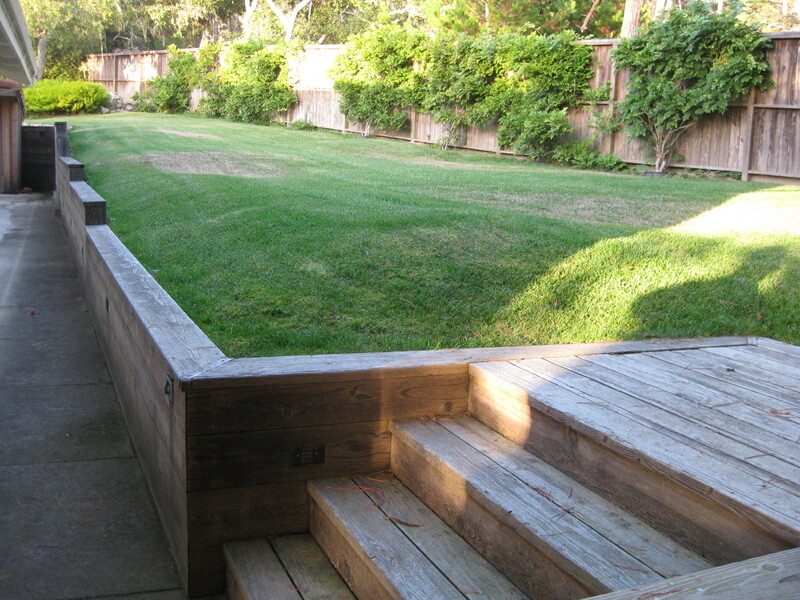 April 2011 Update: The court has held up well after two intense periods of Pebble Beach winter rain. Although during monsoons puddles form, once the rain stops the court drains beautifully. We survived the March tsunami unscathed. Here is a record of one of our first matches. Grandson Paolo is doing a great job of launching his ball (note that it has not yet touched the playing surface) and will certainly get it over the half court line. Jack Tilford is standing behind me and is almost completely obscured. In the second picture, we have completed the frame and are now rolling towards the opposite end. Jack and I are calling out the score to Paolo, who is duly recording it on the traditional scoreboard in which clothespins are used to mark the progress of each team. The results: Joe and Paolo, 1, vs. Jack, 1. We are looking forward to many, many more matches with friends and family. Jack pointed out that this is a very "age appropriate" sport, to which I responded, "at both ends." Just as the game itself goes from one end to the other and then back again, it is also the case that it is fun for both young and old. Perhaps it won't be long before the balls are heavier for me than they are for Paolo, but no matter. We will be playing together.